Background and research interests:Elanie Rodermond (1985) received her Master’s degree in Criminology (including Research Track) in 2012. Earlier, she received her Bachelor’s degree in Criminology (2010) and in Journalism (2007). For her master’s thesis she examined the influence of the vividness of the future self on rule breaking behavior. After that, she was involved in research on the well-being of children of incarcerated mothers at the NSCR and she was working on a study on risk factors for child (sexual) abuse. 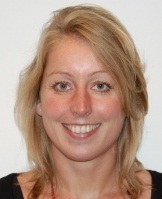 Since October 2012, she conducts a doctoral research, focusing on (the mechanisms underlying) female desistance. Patterns of criminal behavior and backgrounds of female delinquents are examined (based on officially registered data), in order to identify what kind of women have desisted from crime. In addition, interviews with female offenders as well as with females who have desisted are conducted to qualitatively examine the mechanisms underlying female desistance. In addition to her PhD project, Elanie Rodermond is director of the international research institute ´Spinhuis Center for Research on Incarcerated females´.